The Snowdon Horseshoe is one of, if not the best ridge walk in Wales. Although there is not so much height gain as in some of the routes described, the terrain is highly interesting. 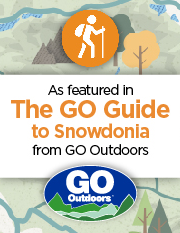 The route should not be attempted by anyone with a fear of heights, since includes the knife-edge arête of Crib Goch, and for the same reason it should be avoided in high winds, and also in winter unless you are properly equipped and experienced. There is also a walk down a steep scree slope on the South East side of Snowdon. Your walk begins at Pen y Pass (the top of the Llanberis pass). In the summer months the car park here fills up very early, and you may need to park in Nant Peris and use the park and ride service, or walk up from Pen y Gwryd (this is also cheaper than using the £10 car park at the pass). From here take the path which goes up to the right, parallel to the pass. This is the start of the Pyg Track which is a well defined path. Ahead of you is Crib Goch, the first summit which you will be aiming for. It has been known for this to be mistaken for Snowdon in the past, causing difficulties for unsuspecting walkers. After about 30 to 45 minutes you will reach a Bwlch from where you will be able to look down to the Llyn Llydaw reservoir, with Lliwedd (your last summit) opposite. The Pyg track goes on almost flat for a while above the lake, whilst you will take the route going up to the West. This will clearly be leading up Crib Goch. The name translates as red ridge, and in the right conditions a look at the ridge will show why. The route up starts off fairly well defined but will begin to loose this definition as you go on up. It will be necessary for you to pick your own route up. I have found that the best way is experience, and that each time you will probably pick a better route. It is recommended to go slightly to the right early on, and then as you near the summit make the final ascent on the East ridge. From the summit you can see along the ridge to the pinnacles and around to Snowdon and then follow the rest of your walk to Lliwedd and down to Llyn Llydaw. From the East end of Crib Goch make your way along the arete to Bwlch Coch. This is a straight forward route in that it follows the ridge. The drop is steepest to your right, and if you are nervous it is suggested to walk to the left of the ridge and use the top for support. The first escape route is from Bwlch Coch. It is a steep slope down to Llyn Glas, from where a route can be picked down by the river leaving the lake to the Llanberis pass. An alternative walk is to follow this escape route in reverse and then reach Bwlch Coch. From here continue following the route as described, probably following the Llanberis path down. From Bwlch Coch you carry on to Crib y Ddysgl. Again this follows a ridge most of the way. There are arrows used for direction on the rocks where it becomes more becomes more difficult to follow the route. When you reach the ridge it may be easier to walk on the right where there is a "path" through loose rock. Care should be taken to stick to the ridge rather than make the mistake of heading down to Clogwyn y Person, especially in the cloud. This can be easily done, believe me! You will then reach the trig. point at the summit of Crib y Ddysgl. This is the 2nd highest mountain in Snowdonia. You will carry on South East off Crib y Ddysgl, and within 5 to 10 minutes you will hit the Llanberis path. This is the easiest path up Snowdon, and will be described further in the Moel Eilio route. Do not head down here but follow the path up to the Snowdon summit. You will pass a large stone, known as the "finger stone" which marks the Pyg and Miners routes which will also be described separately. If you decide that you want to turn back when you reach Snowdon then return to this stone and follow the directions given in the Pyg Track - Miners Track walk. When reaching the top of Snowdon make your way up from the train station to the trig. point at the summit. You will be able to look around to the Glyders and Carneddau to the North East, and the Nantlle ridge to the South West. Anglesey will be visible to the North West. If you are doing the walk in the summer months (April to October weather permitting) when the train is running then you will be able to call in at the cafe for a coffee if you wish. From the summit head off South West for approximately 100m (to a standing stone) before turning to your left where you will descend the "Snowdon scree". This is a scree slope which is the final part of the ascent of Snowdon if you are attempting the Watkin Path from Nant Gwynant. The Watkin is not described here, however it is a prominent path from the car park between Llyn Dinas and Llyn Gwynant on the A498. It passes the famous Gladstone rock, by which Gladstone gave a famous speech about freedom of the Welsh. It is also the Khyber Pass from the film Carry on up the Kyber. The most difficult part of the Watkin being the scree which you are about to descend. Pick your own way down the scree and you will reach a fairly well defined track above Llyn Glaslyn from where you can look back to Crib Goch and Crib y Ddysgl. Before the ground rises up ahead of you, the Watkin path descends to your right, with Yr Aran visible to the South West. This mountain will be described in another route. Do not head down but carry on up to the West peak of Lliwedd. The path is not obvious all the way, and you will need to make your way around some fairly large rocks during the 140m ascent. Once at the summit follow the ridge along over the east peak to Lliwedd Bach. Stay with the ridge for a further 500m, descending during this stage, and then there will be a path down to Llyn Llydaw to your left. It is up to you whether to take this path down immediately, and then follow the Miners track round to your car (do not cross the causeway). The alternative is to put the "final nail" in the horseshoe. This is Gallt y Wenallt. It adds approx. 2.5 km to the walk, and about 1 hr walking. It is off paths across grass. Basically just keep to the edge and follow around to the peak at the end. It is 619m high, and the best option is to return the same way, descend to Llyn Llydaw and make your way down the final tarmac section of the Miners Track.